Returning a projector lamp, TV lamp or SMART Board lamp that you have purchased from Projector Lamps Canada is a simple process. Our aim is to make all projector bulb and TV bulb returns as quick as possible to reduce the amount of time that you are without a functioning projector or television. The first step in returning a lamp to Projector Lamps Canada is to get a Lamp Return Number. This is important because it allows us to identify your lamp return. To return a projector lamp, TV lamp or SMART Board lamp to Projector Lamps Canada, first get a Lamp Return Number by filling out the short form below. This is important because it helps to avoid unnecessary delays to your lamp return. After you click the "Submit info" button a notification will be sent to the Projector Lamps Canada Returns Team who will email you a Lamp Return Number plus further instructions within 24 hours. Can you please provide us with the make and model of your TV/Projector? Shortly after you have received a Lamp Return Number you will be sent a shipping label, which lets you send the lamp back to Projector Lamps Canada. We will pay the return shipping charges for lamps returned under warranty. Please send the lamp back to us in its original box, making sure that there is enough packaging material around the box (e.g. bubble wrap or another larger box) to ensure that the lamp box is not damaged in transit. Please do not write anything or stick anything on the lamp box itself. When we receive your lamp return, if the lamp is under warranty a replacement lamp is sent out within 24 hours (subject to stock availability). 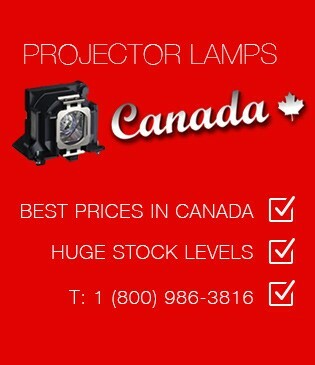 All faulty lamp returns are tested by a Projector Lamps Canada bulb technician.